Coming hot on the heels of the July 25th endorsement blog issue, we have what has been a much more public mis-step by May. On Wednesday, July 27th, May touched off a national firestorm with a couple of tweets about the health perils of WiFi. In the first tweet, May exclaims that she’s glad that she doesn’t have wireless internet access in her home. In the second, she expresses concerns for the health of children attending schools with WiFi. Oh my. When I saw those tweets appear in my own twitterfeed, I took off my glasses and held my head in my hands. I knew that this was going to be explosive. The only saving grace was that she was tweeting about this in July, and not in September. I hoped that people would not confuse May’s stance on WiFi with the Green Party of Canada’s position on WiFi, but as the Leader and spokesperson of the Party, I had little doubt that there would be some confusion. Well, maybe a press release would straighten things out. After all, Twitter isn’t the best venue for nuanced discussions. First off, it’s very unusual for the Party to issue a joint press release. It’s been my observation that the Party goes to great efforts to not involve itself in discussions pertaining to matters within provincial jurisdictions. As a national party, we must respect the division of authorities as laid out in Canada's Constitution, and that’s why the Party has typically left provincial matters in the hands of Green provincial parties, such as the Green Party of B.C., led by Jane Sterk. Most of the other parties operate in the same way, with some notable exceptions where lines have been blurred in the past. So a joint press release is a pretty big deal. The issue being discussed must be one of both provincial and national importance. The press release itself starts off by suggesting that’s just the case, referencing “all jurisdictions”, and the way in which some of these jurisdictions have placed moratoriums on smart meters, or cancelled programs altogether. Ok, this must be pretty serious stuff. I just had a smart meter installed on my home a few months ago, in anticipation of time of use billing being implemented in Sudbury later this summer. Yikes. This must effect ME, my family, neighbours and just about everyone in Ontario who has either received or will receive a smart meter! Ok, so it is a big deal. The national Green Party is doing more than lending its good name to the cause of the B.C. Greens here. It’s trotted out Elizabeth May to make a statement in support of the B.C. Green’s position. It’s issuing a joint press release with the B.C. Greens. It’s promoting the release on the front page of the GPC website. Ok, it’s really got my attention now. So what for goodness sake is the national party taking a position on? And why are we attacking smart meters? “The smart meter program is another example of unsupportable assumptions based on industry lobbying rather than best practices,” says Jane Sterk, leader of the Green Party of BC. “Greens believe all public policy should be evidence based and founded on the Precautionary Principle. “BC Hydro’s wireless smart meter program violates that principle. There are environmental, privacy and security concerns as well as the potential for adverse health risks. This is an issue that hits at the heart of democratic rights. Individuals have no ability to opt out of a program that may impact the health of those with electro-magnetic sensitivity,” says Sterk. So, because the B.C. Greens believe that the scientific verdict is still out on the health-related effects of WiFi, BC Hydro should cancel the installation of smart meters? Sterk appears to be suggesting that this is the case, based on the application of the Precautionary Principle. Look, I’m all for the use of the Precautionary Principle in guiding public policy. I’d even go so far as to agree with Sterk that the jury is still out on the health-related impacts of WiFi. I know that there aren’t all that many studies out there on this subject, and some of the ones that are available suggest that there may be some connections between electromagnet radiation and human health, although cell phones are usually tagged as the culprit. It even makes sense to me on an emotional level that the more humans are exposed to human-made radiation, that there’s probably a greater health risk. So, sure, maybe I do buy into the notion that there’s a risk. But you know what? I cycle to work as often as I can, despite the statistics which show that I’m much more likely to sustain a significant injury doing so than if I were to take the car or ride the bus. But I bike to work because I want to do my part to reduce emissions. I realize that when it comes to the health-related risks of cycling, the choice is mine to make, whereas B.C. residents appear to have no choice but to accept a smart meter attached to their homes. But I don’t have a choice when I walk through the downtown of my hometown, and pass by people using cell phones. Or when I walk through the entrance of a store in the mall which scans me with an invisible something or other to ensure that I’ve not removed any articles without first having paid for them. At work, I sit in front of a computer for 8 hours a day. I guess I could refuse the paycheck and find employment elsewhere, so maybe that’s a choice. Should I be better informed of the health risks associated with all of these activities? Probably. And maybe the government could be doing more to ensure that its citizens, like me, are able to lead safer lives, by somehow influencing the amount of exposure to radiological radiation we all experience. Ok, that statement on its own appears to me to be fair and balanced, and representative of the Green Party of Canada’s position and member-approved policy as it pertains to WiFi. We want more regulation from Health Canada, in keeping with an approach currently being used in Germany. Sounds...sensible. My question remains, though: what the hell is it doing in a joint press release which attacks the installation of smart meters? In a blog post appearing on Thursday, July 28th, titled “The Twitter firestorm and why I said what I said about Wi-Fi”, May attempts to clarify what she was thinking, and broaden the discussion. Thankfully, the national mainstream media seem to have largely ignored the smart meter attack angle at this time, and have focussed largely on May’s tweets pertaining to WiFi in general use. May claims that while WiFi is something which Canadians should be concerned about, but the issue isn’t the top priority of the Party and is far from it. That's good, but she says nothing at all about smart meters. Which continues to leave me wondering: are we for 'em, or are we 'agin 'em? For what it’s worth, I don’t disagree with much of what May has written in her blog. In fact, she’s convinced me that we probably should be looking into the health impacts of EMF to a more significant degree than we have to this point. Her blog references the exact policy resolution adopted by Green Party of Canada Members. In the policy, there is a reference to a “precautionary limit” of 0.1 uW/cm2 (or 0.164 V/m) for cumulative outdoor exposure to radio frequency radiation, which appears to be the limit called for in something called the “Bioinitiative Report” of 2007. I have no idea what this precautionary limit means. I don’t even know what all of the little letters after the numbers actually stand for. But apparently, whatever it is that a WiFi emitter emits, it’s far less than this precautionary limit. At least according to Gary Murphy, the Chief Project Officer in B.C., who shared his thoughts with the Victoria Times-Colonist in the article "Greens want smart meter plug pulled". “I wish they would have reached out to us to get some information,” he said, noting that he was particularly struck by May’s insistence that Health Canada EMF regulations be upgraded to the equivalent of those in Germany. Of course, Murphy is looking at the policy in isolation, saying that smart meters are below the precautionary limit, whereas the policy actually speaks to an aggregate level of exposure, to which WiFi would add its own little bit of radiation to the total that we're all exposed to. But apparently WiFi's addition isn't much more than the contributions made by baby monitors, and a lot less than cell phones. The Times-Colonist also has also run a nice picture of May, Sterk and Trent University Professor Magda Havas, who has recently published a scientific paper which confirms that there are health-related impacts from EMF. All three appear to be at some sort of press conference. Oh my. So not only was there a joint press release on this smart-meter attack between the two parties, but our Leader appeared in a press conference too? In how many different ways is this problematic? First, May appears to be associating herself, and by extension as Leader of the Green Party of Canada, the national party, with a call by the B.C. Greens for a provincial agency, BC Hydro, to stop its smart meter installation program, due largely to health concerns (although security was also mentioned, seemingly as an afterthought). So the national party appears to be getting itself involved in a matter of provincial jurisdiction. I guess if the matter was of national importance, that would make sense. But WiFi isn’t that kind of matter, by May's own admission in her blog, where she clarifies that WiFi is well down the list of the Green Party of Canada's priorities. Look, health risks or no health risks, people love WiFi. Very few Canadians appear to be talking about curbing WiFi use. While I understand that there are some Canadians who are deeply troubled by this issue, it’s simply not on the mainstream political radar. Given that the specific issue here is related to a provincial agency in B.C., the national party really should not have stuck its nose into that business. Especially when it's not our priority. Second, the Green Party of Canada does not have any member-approved policy which calls for anything like a moratorium on the installation of smart meters. The only policy we have is one which calls for more regulation from Health Canada over aggregate outdoor exposure, and a better precautionary limit. Taking this member-approved policy and suggesting that it is somehow supportive of Sterk’s call for BC Hydro to stop installing smart meters is an extreme stretch. I doubt that many Green Party of Canada members would make such a connection. I can’t say for certain that May has either, because it seems that she’s never actually said anything about smart meters or BC Hydro. She’s only lent her appearance and quotes of GPC policy to the B.C. Green Party’s cause. Yet, by appearing with Sterk and Havas at a press conference, by having the Party issue a joint press release, by tweeting about the dangers of WiFi, she has certainly created the appearance to be in step with Sterk’s (in my opinion, idiotic and misguided) attack on smart meters. Remember what I wrote earlier about the Party being concerned that the opinions expressed by members being construed by some to be representative of the Party’s position or policy on a certain matter? Well, that’s exactly what’s happened here. May has created the appearance that the Green Party of Canada supports a moratorium or cancellation of smart meter programs, as a result of concerns related to the health impacts of WiFi. This appearance isn’t in keeping with Green Party of Canada policy. It may be her opinion (it might also not be), but either way, the appearance has been created, and it’s now fair game for other parties, journalists and the Canadian public to leap to the conclusion that the Green Party of Canada is against smart meters. If we’re not, what was our Leader doing at the press conference, through the joint release, and on Twitter? And the final problem, which for me is the biggest. What on earth is the Green Party of Canada doing coming out in support of any attack on smart meters? Aren’t smart meters supposed to be one of the tools we use to help create a smart electrical grid, which will assist us in conserving energy, reducing greenhouse gas emissions, and fighting climate change? Last I looked, that was the plan. The fact that smart meters will also save Canadians money through conservation is another added benefit which I had been under the impression was a good thing too. I joined the Green Party of Canada because it has been the only political Party in Canada which actually had a plan to combat climate change. Unlike the unknown cumulative impacts of WiFi on human health, we have a pretty good idea what the cumulative impacts of climate change are likely to be, at least as a minimum. Let me tell you, the two can not be compared. The devastation which will be wrought upon our society by a changing climate will be far more significant to a much higher proportion of humanity than those whose health may be effected by having a WiFi smart meter installed in their homes. I joined the Green Party of Canada because I am extremely concerned about the future health and well-being of my family, because of climate change. I am concerned about the economic and institutional damage that a warming climate will bring to Canadians. I am concerned about the security implications. For me, climate change is the biggest issue Canadians are facing today. If the Green Party of Canada is going to start undermining its own member-approved policies and plans for tackling climate change over fears related to WiFi and other unproven scientific issues, invoking the “precautionary principle” and saying that we can’t do anything until all of the evidence is in, even when doing nothing will certainly cause a greater negative impact, well, that’s not the Party that I joined. The other parties like to make it up as they go along. The Green Party, for the most part, has been different. But we now have a clear example of the Leader of our Party taking a contrary stance to what I believe is the will of a majority of Party members. We can not let these concerns about WiFi derail establishing a smart grid, which will assist in creating that culture of conservation which we need to establish in this country. I understand why the B.C. Greens have come out in opposition to smart meters – they likely believe that they can score some cheap political points with the anti-EMF crowd. That they are pandering to a handful of well-intentioned activists instead of looking at the greater and broader interests of British Columbians says a lot to me about what the B.C. Greens goals must be, and it saddens me that they have decided to substitute good public policy and programming for a cheap effort to score some votes from core constituents at the expense of the greater public interest. Make no mistake: the greater public good is served by efforts to combat climate change, rather than going after WiFi. The B.C. Greens have clearly lost sight of that, probably in an attempt to hold onto a core voting block. If I were a B.C. Green, I would be tearing up my membership card today. I don’t foresee Sterk reversing herself on this issue. And I don't foresee the B.C. Greens going anywhere in the next provincial election if they are going to attack government initiatives which actually will do something to help fight climate change. But Elizabeth May must at the very least come clean and now take the time to explain to Canadians that the Green Party of Canada does not stand in solidarity with the misguided efforts of the B.C. Green Party. May hasn’t said anything yet about smart meters, which is both good and bad. Good, because the GPC doesn’t have a policy against them, and good too because in saying something positive about smart meters at this time, she will not be in a position of having to contradict herself. Her silence on smart meters is bad, though, because it lends credibility to the notion that the Green Party of Canada is, like the B.C. Greens, against the use of smart meters. And the longer it takes for her to clarify the national party’s position on smart meters, the more that people will be able to rightly conclude that the Green Party of Canada really is against the use of smart meters. And with elections coming up in PEI and Ontario in a few months, it really behoves May to provide clarity on smart meters sooner rather than later. And although the majority of the national party’s members might not be watching, a number of engaged members are. Comments appended to May’s blog have been almost unanimous at this time in their condemnation of the smart meter attack. Elizabeth May, I have the utmost respect for you, but these two recent issues have shaken me. Please, refrain from further involvement in the Party’s electoral processes; do not send an email to members with your endorsement, as your voice carries too much influence, and you alone have the ability to access the membership in its entirety. And please, clarify the Party’s position related to WiFi smart meters. Make it clear to Canadians that the Green Party of Canada continues to believe that smart meters are an important part of a smart grid, which will help us create a positive culture of energy conservation. Please have the Party issue a press release to that effect - and have them remove the joint release currently posted to the Party's website. Better a bit of a “mea culpa” at this time than the dissension in the Party’s ranks which is sure to come, along with continued public criticism. 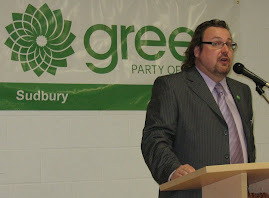 Blogger Steve May's posting a link to here at the GPC leader's blog post is appreciated (there will have to be split posts for length, please follow after this one). I feel I should express myself on this topic among GPC-ers. It was in part the very low likelihood of GPC prioritizing these matters that had me drop membership and direct attention to direct advocacy. Now that GPC has connected with what is the most pressing health & environmental issue of our day, even with misconceptions abounding, and given my two years of research and advocacy on topic since letting go of GPC, and having been of some influence myself in GPC's current contentious connexion with the matter, I wanted to post, for the record, whether or not immediate interest in the "storm" has lapsed. I have in any case been told that in the fall the general topic should resurface in some form via GPC. So here's some prep & debunking. I was involved with Parliamentary hearings on topic last April. You are urged to listen to or read proceedings. Meetings 12 & (esp.) 13 via http://www.parl.gc.ca/committeebusiness/CommitteeMeetings.aspx?Cmte=HESA&Language=E&Mode=1&Parl=40&Ses=3 . If even after just that any of you remain content with the feeling that this is not a grave matter that needs urgent redress, and deserves prioritization, it is hard to see how any political commonality can be had between us, intuition about which led in part to my leaving GPC. Following those meetings, three European witnesses suffered persecution for their public whistleblowing. A fourth had retired, but attested to similar persecution before retirement. In Europe, such persecution of academics involves things like removal of offices & lab access. There is much more. Here is one letter that was of some influence, esp. after translation into Greek & circulation in Greece, about the most vulnerable of those witnesses, someone posted it at http://www.scribd.com/doc/34967998/Academic-persecution-for-having-rendered-great-public-service-by-testifying . More than is related there happened to Dimitris P., but is not this cluster of incidents, esp. with its Cdn. connexion, further enough to get you thinking that complacency in these matters is wrong? A third meeting on Oct 28 was assembled, I believe with the secretive intent to narrow the focus away from the general problem of the unprotectiveness of industry-abetting "Health" Canada standards (read eg veteran employee Shiv Chopra's, Corrupt to the Core, for an idea about the real culture behind your federal "safety" regulator). The focus narrowly tended to be wifi in schools. Travesty that wifi-ing children is, given all that is known about the dangers, that meeting was called more to try to make up for the poor showing by industry hacks & hirelings at the first two (above), and to distract from the general matter. I could explain in detail uglier goings on, but no need here & now. Especially Martin Blank's testimony getting on high Cdn. public record, did make the extra meeting of some worth. Now that HESA committee had a large number of submissions from knowledgeable people as well as the oral testimony. What they did with it in preparing their final report to Parliament is almost not worth referring to at all, esp. as it censored away the damning stuff, overseen I bet via some late Committee membership replacements by the Liberals, to make sure the more attentive and caring Liberal(s) did nothing to perturb perpetrators. (The heavyweight loyalist replacements were both defeated in the election; the original Liberal HESA MPs all won; but Liberals still as a class are evasive as ever.) One example of a censored item, showing that dangers were well-known to the Cdn. govt. via its own advisors, yet the programme of mass irradiation pushed ahead anyway in lockstep with international perps starting from about the same period (1973! ), is this doc someone put at http://www.scribd.com/doc/30905148/NRC-Canada-Environmental-Pollution-by-Microwave-Radiation-Potential-Threat-to-Human-Health-1973 . As for the claim that dealing with climate-related problems takes precedence, that could only follow from lack of looking into what is going on -- the maximal claim is, that electromagnetic misuse has been, and is worsening as, a necessary condition for so very many strange ailments of the past century, autism to ALS to cancer to dementia, there must be sommething for each letter of the alphabet. This is not a one-cause-fits-all claim at all. It is about the pervasive still little understood deleterious environmental contaminant that xenobiotic EM radiation is being found to be and have been. The suffering has been put over the top with esp. mass cell telephony & its infrastructure. The grip on mainstream information & news sources had by telecom & abettors, is a big reason why it is not common knowledge that the whole grand issue needs redress. As important, is the grip had on research, and if this is not telling to a "Green", I don't know what could be: involving 1000s of studies over decades, two studies revealed, as with other bioeffects research, industry-connected study shows some 3/4-plus "no harm", independent study the opposite by a similar proportion. How's this: the insurance industry long ago pulled back from the cell phone industry, expecting eventual catastrophic court judgements. I should at least, I realize, do you the courtesy of...roundly criticizing you for your uncharacteristic use of the term, 'idiotic', above, which you'd do well to retract. If Sterk et al had a look or listen on the dangers of wireless, it is utterly obvious that wireless smart meters are to be rejected. There are wired alternatives for TOU metering, it seems that hre/their responsible stance promotes that, does not with dispense with the laudable aspects of the project. Why did "Green" commentators miss that? Amazing. I came across a tweet from Elizabeth May over the weekend with regards to smart meters. She had tweeted that the GPC has never opposed smart meters. This is good news, but I continue to believe that the GPC and May need to more publicly aggressive with this message, especially given what's been reported about our Party. May tweeted: "ElizabethMay @TRTooke As I said in our news conf, greens support smart metres as part of a smart grid, conservation strategy. #SmartMeter 5 days ago in reply to TRTooke"
Yes, the smart meter thing is touchy among Greens -- and as you might know, Hoodack might (ineptly & for wrong reasons) campaign anti-smart-meters for Ont PCs this fall. The whole affair involved responding to the dangers of wireless. TOU metering has been around for decades for large utility customers -- via a safe wired connexion. What attaching meshed wireless meters does, is to attack people in their own homes even if they avoid all of latter day wireless mania (as we do, at 1st intuitively mostly, now with heaps of strong evidence on all kinds of fronts), and it adds yet another layer to e-smog in neighbourhoods where there might have been little before -- if the killing cell phone infrastructure did not get a district, the smart meters will. Did you notice the Dutch study of wifi effect on trees last yr? Got much press notice. I am told by a principal participant that it is ongoing in replication now, and looks like results will be just as damning. How can a Green turn away from that?! It is not about rejecting conservation etc, it is about rejecting and replacing dangerous wireless, let wifi & smart meters be the wedge into the general issue. And the matter cannot be avoided as a prov. matter alone -- the fed. govt. licenses meters, they can speak to the wireless aspect. It looks like at least two sections of what I posted are missing above, I'll try to rewrite, it is that important. It had to do with explaining why the running on particularly about the HESA committee -- because the Council of Europe enviro. etc committee heard similar testimony, and acted, responsibly, completely opposite to HESA, and had their text adopted by its Parl. Assembly, which is as august as it gets for political advisory in the EU. IN HER BLOG POST ELIZ. LINKED YOU TO THAT COE DOC - AND NONE AMONG GPC DISGRUNTLED SHOW ANY EVIDENCE OF HAVING LOOKED AT IT! How responsible is that?! You might have found out that the rapporteur is a Green from Luxem. That Greens lead in the EU on these issues. @ck872 (Daryl) - no, I haven't removed anything. Unless it's spam, I'm not likely to remove any comments on this site.